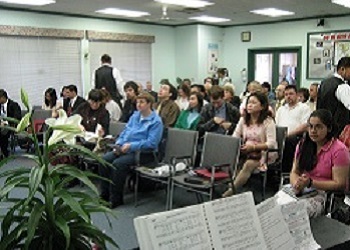 We are an independent, fundamental, Bible-believing Baptist Church located in one of Canada's fastest growing cities, Surrey, British Columbia. 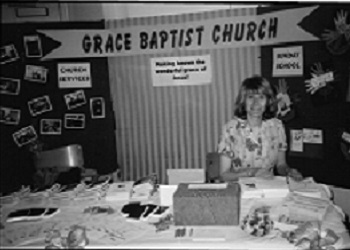 Grace Baptist Church began in September 1999, in Pastor White’s livingroom with a cardboard box on top of a stool for his pulpit , and with 6 people in attendance(Pastor White and his family and one other lady). 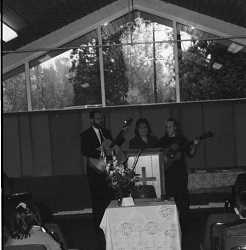 With one hundred dollars, we had our first official service on October 3, 1999 in the Bear Creek Park Pavilion. Utilizing free advertising in the local newspaper and printing flyers to hand out in the neighborhood, there was enough money left over to rent 2 hours in the Pavilion. And so began our first service. 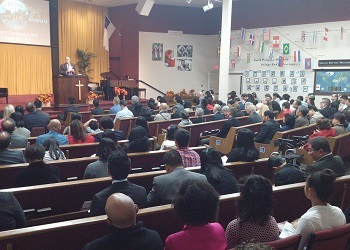 Twenty five people attended, and the church received enough offering to rent the building for the next week. God blessed, and soon we were able to rent space for both a Morning and an Evening Service. Since the building was basically one room, we hung up blankets to make dividers for Sunday School Classes. We even custom made a curtain to put up on the one large window, to help keep the distractions out. It was an exciting day when we purchased our first set of matching vests for our ushers to wear. Over that first year we started a Bible Study in a local Drug and Alcohol Recovery House, and we took part in two local festivals, one for the Newton Days and also the Hydrangea Flower Festival. We were making the name our our church known in the community. 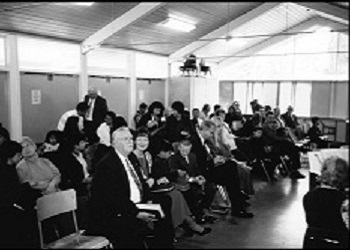 By the end of 2000 we averaged 45 people in the Morning Service, we supported 3 missionaries, Pastor White preached in English and Sign Language for the deaf (at the same time), and we were outgrowing our current facilities. God was so good. 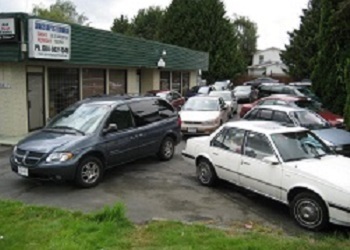 He opened the door for us in 9061 King George Blvd. This building was only 3 minutes away, and we were able to use the buiding 7 days a week. We continued to grow. God brought us a man to interpret for the deaf while Pastor was preaching. We began to have monthly Ladies Meetings, and Men's Meetings. Pastor White taught a course on Financial Freedom, and God was giving us many talented ones who could sing and join together in our first choir. We began a Tuesday Night Bible Study Outreach to help those in the neighborhood with spiritual needs, and food. Also, our Bible Institute began and taught classes on Monday and Thursday nights, with several local pastors helping teach, and people from their churches attending. Family Camp was a special time for us all, and over the years we have tried out several different locations. And we began our first Junior Church program. In 2003, we hired our first summer student, Becky White, to start our tradition of hiring students to work for the church each summer and led our first Vacation Bible School and in the fall began the Youth Get-Away (our regular youth group meeting every other Friday evening). In 2004, we hired 4 Bible College students to intern with us for the summer, one of which was Justin Wamsley. In 2005, after he graduated, we hired him as Youth Pastor. He began our Summer Youth Camps, and continued building the Vacation Bible School each year. 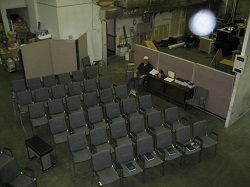 By 2007 our attendance averaged 95 each Sunday Morning, and our parking lot was congested. There was no more room left inside or outside. Again, God blessed, and led us to unit #18 at 13478 78 Ave., only 7 minutes up the road. This building was two and a half times larger than the previous, and the parking spaces seemed to to go on forever. This building required our first large building project to three quarters of the building. Much planning, labour, and money were used, but it turned out beautiful. We finally purchased an overhead projector to help to illustrate graphs, photos, announcements and many other things. But we purposed that it would never replace our hymn book or Bible. This building finally allowed us to build our own baptistry, meaning we no longer had to visit other churches to use their baptistry in the afternoon, or go to the home of a church member to use their hot tub in the back yard. At this time, we also began going to the Kinsman Place Lodge to hold monthly church services. In 2008, Pastor White wrote our 6 part, in-home Bible Study system to give to unsaved people in order to teach them about God and lead them to salvation. We soon started to take the Bible Study door to door in the neighborhood. Soon after, we started a small soul winners club called the Search and Rescue Team. By 2010, our average Sunday morning attendance was 120. God has been so good to us. We have seen folks saved, baptized and added to the church. Again, we were outgrowing our building, so by 2011, the Lord allowed us to move into 13570 78 Ave, which is our current location. The closeness of location was great, for it allowed us to pick up the pews in our old building and carry them across the street. What a sight it was! We even cut our baptistry in half to get it through the doors, and wheeled it across the street too. 2012 saw the arrival of Tim Taylor on staff, as Children’s Pastor. This was also the year we began our JOY (Just Older Youth) Seniors’ ministry. 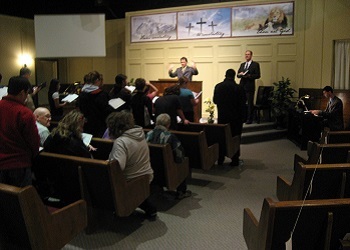 Grace Baptist Bible Institute (GBBI) began to offer night classes which would eventually lead the start of our own Bible College. British Columbia Baptist College started in 2013, and David Robart came on staff to help train future Missionaries, Pastors, Teachers and Church Leaders. Also in 2013, we started a bus ministry which has been allowing us to bring children--who might not have had the opportunity to hear the gospel otherwise--to church. That brings us to 2017. We have 5 main areas of ministry: church services, soul winning, bus ministry, missions, and our Bible College. We currently support 56 missionaries around the world through prayer and monthly support. So why do we go to all the trouble and time and expense of starting and maintaining these missionaries? Because we’re doing it for the Lord Jesus Christ according to His commandment in Matt. 28:19-20. We have seen souls saved and baptized and added to the church. We have seen offerings grow, a good increase in the number of missionaries we support and spiritual growth in the lives of our church people. Why don’t you come visit us this Sunday and experience what we enjoy!